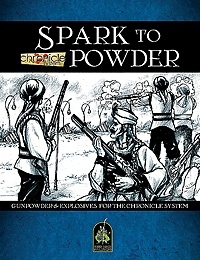 Now available in our Green Ronin Online store is Spark to Powder, a new PDF release for the Chronicle System. Spark to Powder moves the Chronicle System’s technological “slider” a little bit further up the timeline, to what might be termed the Gunpowder Age. This PDF book presents equipment and Benefits that reflect the advent of gunpowder and firearms technologies, but also examines some of its ramifications on a House’s Holdings and its Warfare Units as well. Add a bang to your Chronicle System campaign!